The new Polo Rome is an all purpose polo and training boot with a zipper at the front and a lower heel reinforcer of the boot. A zip protector on the top with a buckle with Rhinestones and also a protector over the heel with the same Rhinestones buckle. The shaft is at the outside extra stiff. 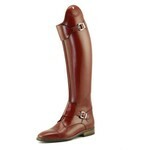 This decreases the pressure on the rider's ankle to ensure maximum comfort. The bootleg is extraordinarily elegant with a snug ankle fit. The Polo Rome has a full inner calf leather lining.